FCM relies on radar detection of obstacles in front of the vehicle and is constrained by anything which limits its ability to detect, such as dirt, mud or snow covering the radar sensor. In such circumstances, the on-board monitoring system would notify the driver of impaired radar detectability. FCM uses a single radar sensor which, in normal circumstances, will detect all vehicles. Conversely, the system may sometimes detect metallic objects which pose no threat. More sophisticated, multiple sensor systems help to overcome such issues. 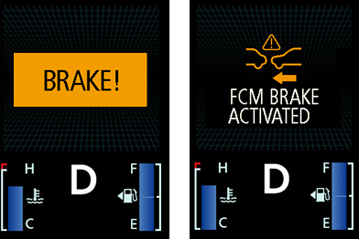 However, Mitsubishi has carefully balanced the sensitivity of FCM to maximise its effectiveness when needed and to minimise irritation to the driver when it is not needed.